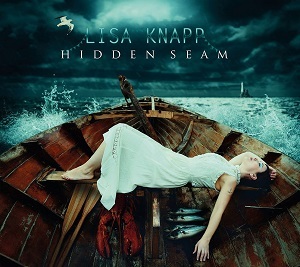 Lisa Knapp released her debut album in 2007. Now, six years on she is releasing her second album - Hidden Seam. "Shipping song" is basically Lisa singing the names of the shipping weather forecast areas to music. It sounds like a strange idea but if you don't pay too much attention to the lyrics it sounds beautiful. Unfortunately she decided to throw in some sound effects - motors, marine sound testing recordings and the sounds of sea creatures. For me this ruins the song as it jars and distracts attention away from the song - early in the song it sounded like there was a problem with the CD or the speaker cables but no - it was intentional. A lovely song spoiled in my opinion and it's a track I skip past whenever I listen to the album. Having said that, other people may love it. Title track 'Hidden seam' has a sound thats somewhere between folk and pop. It's a song that certainly stands out, with it's Bjork-like vocals and the up-beat pop-like tune. It's an interesting album. While it's got a strong folk base, there's also a strong experimental feel which gives the album a slightly bizarre sound at times - it reminds me of Bjork in some ways - quirky and unusual but very good. At times the vocals remind me of Cerys Matthews (Catatonia). As a result of these strange elements the album really stands out from other folk albums. It's definitely well worth a listen. 'Hidden seam' will be released on 14th September via Navigator records.